46 min. Weston Woods. 2017. $59.95. ISBN 9781338162073. 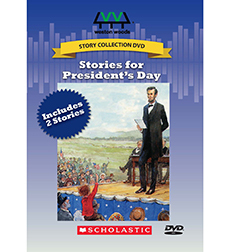 PreS-Gr 3—This compilation includes two stories, Just a Few Words, Mr. Lincoln and George Washington's Mother, both by Jean Fritz. The first is narrated by Rex Robbins and tells the story of the Gettysburg Address. It begins by stating President Lincoln's "big jobs," freeing the slaves and winning the Civil War, and then defines his "little jobs" as hand shaking and letter writing. The text is a bit twee and dated, especially in the second story, read by B.J. Ward—a female voice for a story that doesn't flatter George Washington's mother and seems gratingly unenlightened now. Fritz writes that Mary Ball Washington was "pretty as a rose" and noted for her gingerbread baking and her repeated laments of feeling poor and subsequently asking people for money, while the camera pans the static pictures from the books. Music by Bruce Zimmerman suits the moods of each story, from somber to celebratory. Robbins's dramatic reading of the Gettysburg Address is affecting, and the photographs interspersed among the illustrations give the first story gravity. The illustrators, Charles Robinson for the Lincoln story and DyAnne DiSalvo-Ryan for the second, have similar styles, with DiSalvo-Ryan being a bit more whimsical. VERDICT These rereleased stories are an optional purchase for elementary school and public libraries.